SOME cars have the ability to make you go a bit weak before even sitting in them. 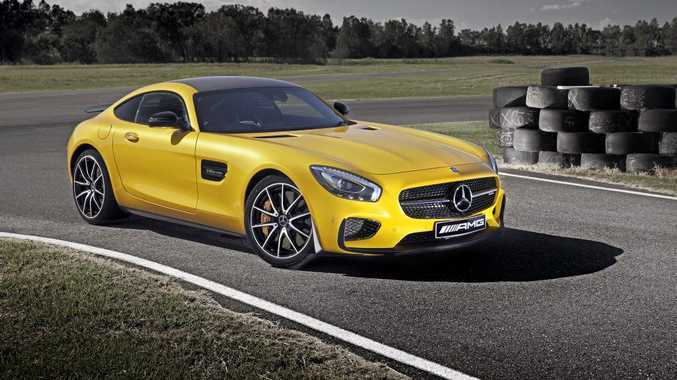 Mercedes-AMG's new GT S is one. Here is the unofficial successor to the gull-wing doored SLS AMG, looking sleeker than ever and costing nearly $200,000 less. If ever a $300,000 car was a bargain then this twin-turbo 375kW/650Nm is it, and will give shoppers of Porsche's 911 or BMW's M6 something to consider over their caviar brekkies. Loaded with smart tech, weight-saving structure and an uncompromisingly athletic design, the new GT S is a grand tourer tour de force with a desirability level off the scale. Electric AMG seats are firm but nicely curved and supportive, so even after a few hours in the saddle there was no discomfort. The seating position is wonderful, with the slim windscreen and hectares-long bonnet giving a real purposeful feel - it may be claustrophobic to some, but this is real GT sensation. The centre console - a huge thing inspired by the V8 shape - takes some time to learn to navigate effectively, and the likes of the gearstick are set so far back that a degree of arm contortion is needed, but an opulent dash with high-quality screen delights. Highway cruising on decent road surfaces is pliable enough in Comfort setting, but on poor surfaces you really feel those bumps through your backside. Sport rather than Sport+ setting was our preferred happy middle ground, but crashiness is a given in this tightly sprung AMG. With 4.0-litre V8 twin turbo launching you to 100kmh in 3.8-seconds, performance is earth shattering, and matched to one of the finest exhaust notes you'll hear this side of an F-14 Tomcat fighter. Lift off the accelerator and you're rewarded with a mix of burbles, pops and grunts that have you shouting in appreciative delight. The whole drive experience is an assault on the senses. Throttle response is instant and it's wise to never stomp on the loud pedal - make no mistake, this is a brutal muscle car that will wag its tail, and the torque on offer - all 650Nm of it from 1750rpm - is mind-blowing. WAGGING TAIL: With 375kW and 650Nm from the 4.0-litre twin-turbo V8 a closed track session is the only way to explore the full potential of the GT S.
Steering is still hydro-mechanical rather than electric, and the benefit is felt with superb feedback and a pointiness that makes it easy to place into a corner, despite that vast bonnet. Wonderfully balanced and composed, it is above all else a car that exists for the excitement of the drive. The GT S is a brutal work of magic. Plenty for your money. Inside, Nappa leather upholstery, AMG heated electric Sports seats and alcantara flat-bottomed steering wheel, hi-res 21.3cm colour display, 3D navigation, keyless package, lane tracking package, Burmester surround sound system, two-zone climate control and touchpad finger gesture controller. Then your choice of 19- or 20-inch AMG titanium alloys, electronic rear axle diff lock, performance exhaust system, glass panoramic roof and loads more as standard. If you consider the Porsche 911 or BMW M6 as rivals, these four-seaters trump the GT S in the practical people-moving stakes. If you prefer your supercar grand touring to be strictly for two the cabin is spacious enough, and the boot does swallow a couple of overnight bags with space for more. The GT S sits so low and has a high door frame base, so clambering in and out would be a mission for those struggling mobility-wise. The solution? Get rich young and buy one while your knees still work. STUNNING: An eye-catcher from every angle, but the Solarbeam yellow paint will set you back an extra $13,500. A quoted 9.4-litres is decent for a 375kW supercar, and our high-revving test on the Great Ocean Rd returned less than 14-litres/100km. For the thrills and sound, that's petrol money well spent. One of the most beautiful designs we've seen in recent years, the GT S wisely takes inspiration from the 300 SL of the 1950s, albeit without the gull-wing doors it and the 2010 SLS AMG sported. 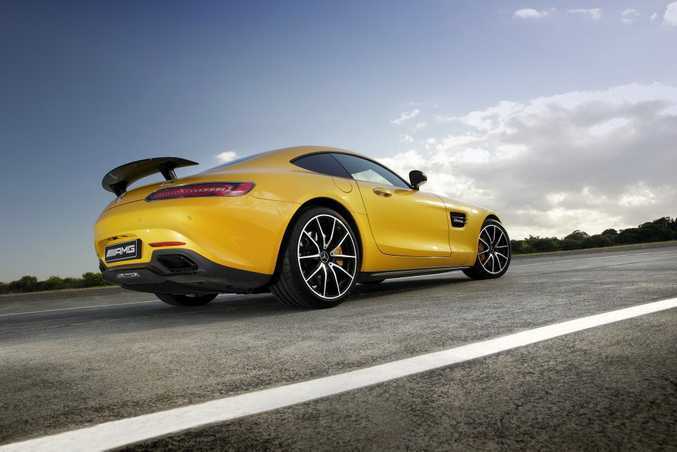 Its huge bonnet, short front overhang and very flat LED rear lights blend to create a mesmerisingly beautiful GT car. Happy shoppers should also consider a Porsche 911 Carrera S ($245,200), BMW M6 ($298,675), Jaguar F-Type Coupe R ($226,970) and Audi R8 Coupe ($279,500). 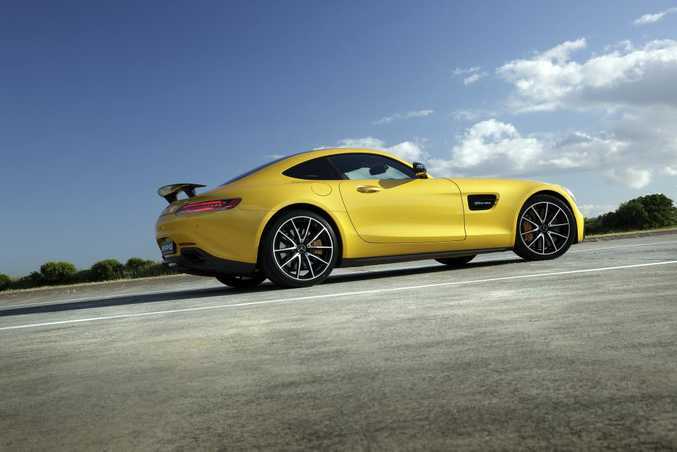 A hero sports car fit for a poster on any teenage boy's bedroom wall, the GT S is a sublime grand tourer for the ages. Shattering performance and a sound that would have Satan himself duck for cover makes this Merc-AMG a muscle car dressed in a sleek body an instant hero. Exploring its full potential in Australia is nigh-on impossible - an Autobahn, Alpine pass and the French Riviera would be the GTS's ideal hunting ground - but no trip would ever be anything less that a fun-filled delight in this masterwork of engineering. What we'd like to see: A less awkward reach to get to the gearstick, the beautiful Solarbeam yellow paint costing less than $13,500 as an option, Australia's senseless Luxury Car Tax abolished to drop the price by more than $50k. Servicing and warranty: Three year/unlimited kilometre warranty. Servicing is at 25,000km or annually. Details: Two-door rear-wheel drive sports grand tourer. Engine: 4.0-litre V8 twin-turbo petrol generating maximum power of 375kW @ 6250rpm and 650Nm @ 1750rpm. 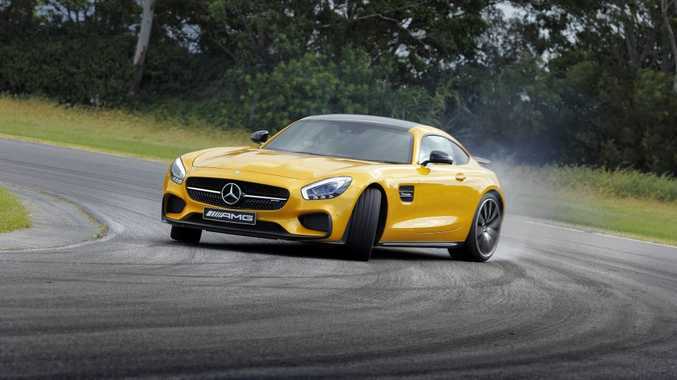 Transmission: AMG Speedshift DCT 7-speed auto with paddle shift. Performance: 0-100kmh in 3.8-seconds, top speed 310kmh (electronically limited). Consumption: 9.4-litres/ 100km (combined average). Bottom line: $294,610 (before on-roads).